SH Blue Steel was adopted on Valentines day. Steven called several weeks ago and said they wanted to adopt Steel, he was there foster boy and they both fell in love with him, Steven wanted it to be a Valentine gift and surprise to Mylynda! What a nice guy! 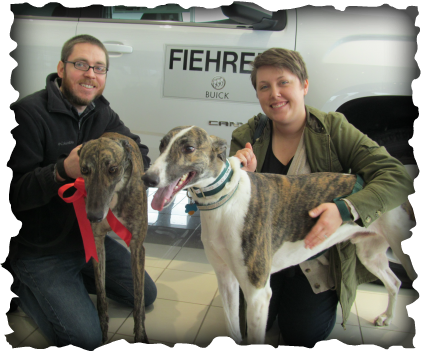 When they arrived at the Fiehrer event I told Mylynda Steel's new owner was here, the look on her face was devastating we had to tell her she was his new family!!! HAPPY lady and Steel is the lucky pup to be in his forever home now!